Hurricanes Harvey and Irma have had a catastrophic impact on the lives of so many in Texas and Florida. As a Florida-based company, no one understands that more than Novation. 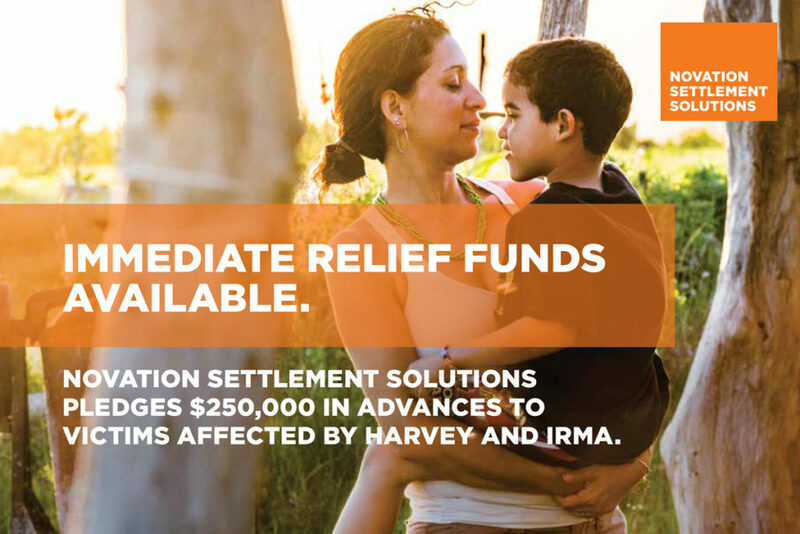 That’s why we are providing customers with immediate cash advances of up to $5,000 to help reset and rebuild lives. If you have a qualifying structured settlement or annuity, call 1-800-754-1129. You may be eligible to receive immediate funds — up to $5,000 — to help you and your loved ones start putting the pieces back together. Novation is urging anyone in need of an advance to call 1-800-754-1129 as soon as possible as funds are limited. Together let’s begin to reset and rebuild. © 2017 The cash offer enclosed is not a loan. It is a cash advance as part of the purchase price from the sale of some or all of your structured settlement or annuity payments and will be subject to underwriting requirements. Unless you qualify, you may not be approved for an advance, and even if approved, you may not qualify for an advance in the amount enclosed within. This offer is subject to (1) you calling us at the toll-free number provided in this communication and then executing and returning to us the contract and all ancillary documents required by us, (2) our confirmation that you will receive structured settlement or annuity payments, (3) our determination that you can enter into an agreement to sell all or a portion of those payments to us and (4) your satisfaction of our underwriting guidelines. Offer void where prohibited and all transactions are subject to federal, state and local laws. Offer is open only to U.S. citizens or permanent legal residents (green card) who have reached the age of majority in their respective domiciliary state as of the date of this letter and who satisfy the terms and conditions above. We reserve the right to correct typographical, clerical or printing errors in any materials. Novation Settlement Solutions is part of the Better Brands Alliance (BBA). The BBA is privately owned and operated by Novation Ventures, LLC. This offer is limited to one per person from any one BBA brand within a 90-day period from receipt. For a full listing of BBA brands, please visit betterbrandsalliance.com. Novation Ventures and its BBA companies reserve the right to cancel or change this offer at any time.